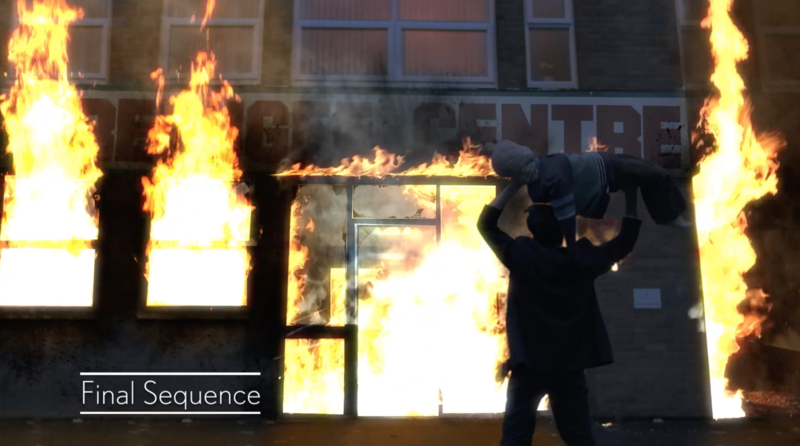 VFX Breakdown: Burning buildings, matte painting & object removal. A few months back The Sketch Files, an online comedy collaborative, approached me in need of a few visual effects on a project. Most notably they wanted a building to be set on fire. Simple enough…. I started by removing the lens distortion to straighten the lines in the shot. Then I proceeded to paint out the car in shot as that too would be on fire, causing a huge headache. After finding some stock smashed windows I cut them out and comped them over the windows in the shot. I rotoscoped the actor out so I could composite the new elements into the shot. I then created the sign, blended to the original shot and then added a tonne of burns to sell the idea that the building was on fire. Next I used an orange solid with a wiggle expression to create some interactive lighting. From pre-keyed stock footage I added flames, smoke and glowing embers. 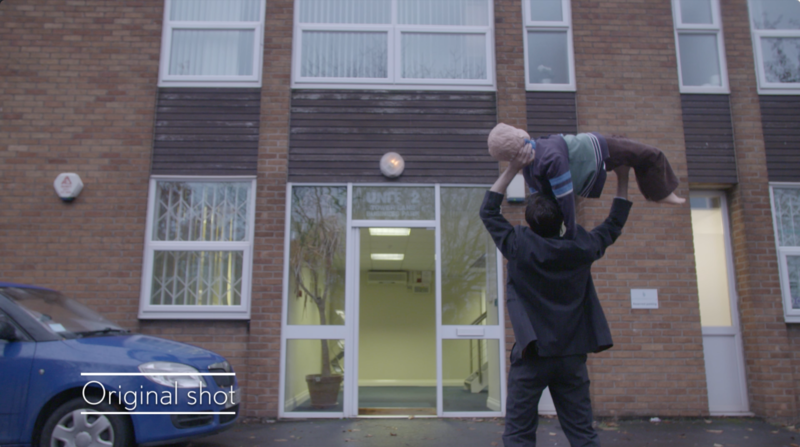 A touch of glow, distortion and day for night colour grading and it’s done! The other VFX shots were a little more run of the mill. The objects needed to be tracked. Sometimes a coloured solid can be tracked over the sign as was the case for the van or in the case of the jacket it just needed another part of the jacket grafted over the top. So simply create a patch that you can use as a track matte then duplicate the shot, set to alpha track matte then drag until it looks natural. 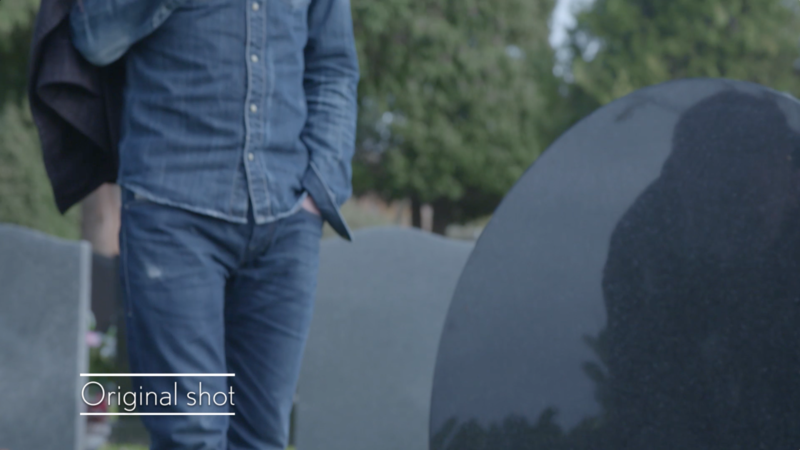 The reflection on the tombstone was tricky. I tracked the original stone, then found a similar texture online, and blended the two so in effect I replaced most of the tombstone backing. For the microphone removal, I used a similar method as the logo on the jacket. Track, mask, duplicate and move to graft another piece of the shot (the actors’ neck and shirt) onto the offending object. And that’s all. If it is useful for some of you, I could create a step by step guide on some of these effects. Just let me know in the comments section on the video or by getting in touch through the contact section of this website.